Delphine and Solange are two sisters living in Rochefort. Delphine is a dancing teacher and Solange composes and teaches the piano. Maxence is a poet and a painter. He is doing his military service. Simon owns a music shop, he left Paris once month ago to come back where he fell in love 10 years ago. They are looking for love, looking for each other, without being aware that their ideal partner is very close... A film whose scenario is much less important than its feeling of euphory, according to the director Jacques Demy. 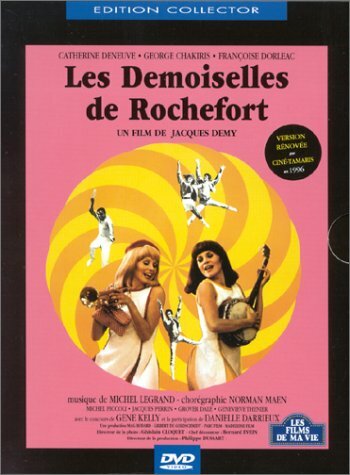 In the little town Rochefort lives Delphine (Catherine Deneuve) and Solange Garnier (Fran�oise Dorl�ac), two musical twins that teach music and dance to kids. One day, Etienne (George Chakiris) and Bill (Groover Dale) arrive in town, and need the twins help with a song and dance-number. Also, the famous piano-player Andy Miller (Gene Kelly) comes to town to help an old friend. Deneuve + Dorleac x Demy = Delightful! 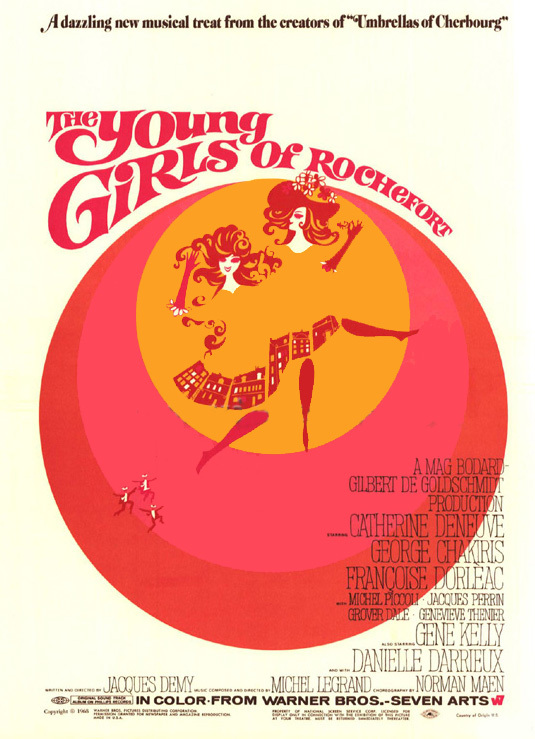 THE YOUNG GIRLS OF ROCHEFORT is Jacques Demy's followup to his popular international success, THE UMBRELLAS OF CHERBOURG.It's not the same kind of operatic musical as it's predecessor and is much more a product of it's time (and sadly, that makes it much more inaccessible to modern audiences). What you get here is a romantic farce in the old MGM tradition, with lot's of garish 60's-style color and costumes, definitely in tune to Michel Legrand's astounding jazz score.The campy outdoor dance numbers date, but thankfully give way to dynamically orchestrated instrumental versions of Legrand's music.This is definitely a movie for those who enjoy cinematic musical comedy, it's visual appeal is undeniable and each shot is lovingly designed and framed.Deneuve and Dorleac are amazing beauties and presented in their prime, which is reason enough to enjoy the picture.Michel Legrand's score is far more complex melodically and orchestrally than his more famous one for UMBRELLAS, it's a joy to listen to.About the best compliment I can pay THE YOUNG GIRLS OF ROCHEFORT is to say that it brilliantly precedes and shines with more talent and energy than the recently released MOULIN ROUGE (a film that surprisingly has a lot in common with it).Demy doesn't need any CGI, MTV-editing or pop songs to get it's simple, lovely message across!It's very nice indeed to have a restored version on DVD of Jacques Demy's LES DESMOISELLES DE ROCHEFORT!